a few days ago I was on the clearance sale of a local toy shop and found some old slot cars from different manufacturers. Personally I have no slot racing track and even no big interest in them. But they are up to 40 years old and they were quite cheap so they have to come with me. The problem is that I bought two Nikko slot cars which are really hard to identify for me. Both are white Corvettes, one seems to be a demonstration model at that time because the shell looks really used and is also broken on the front end, the other one is brand "new". I've made some Google searching and it seems to be a radio controlled slot car. It is about 8 cm long. Maybe someone of you know this model and can tell me for what race track it is suitable. While I'm not very knowledgeable, I can point you in the direction of someone who is. 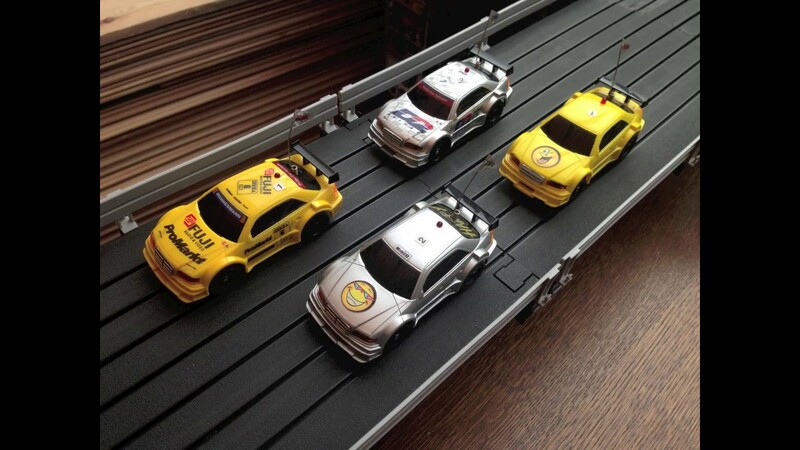 Tamiyadan, a member of the RC10talk forum knows a great deal about slot cars and would likely be able to help you out. 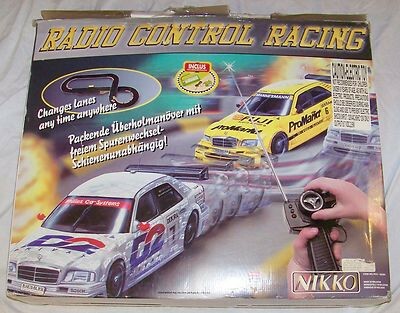 I have never seen that Corvette before, but it appears to be a car for the Nikko RC Slotcar Racing System. I bought a complete set around 1998-1999 when a local shop reduced the price by 50%. I was curious about how well it worked. After all, Carrera failed pretty badly with their similar "Carrera Servo" system in the eighties and I couldn't imagine Nikko would release something equally bad. 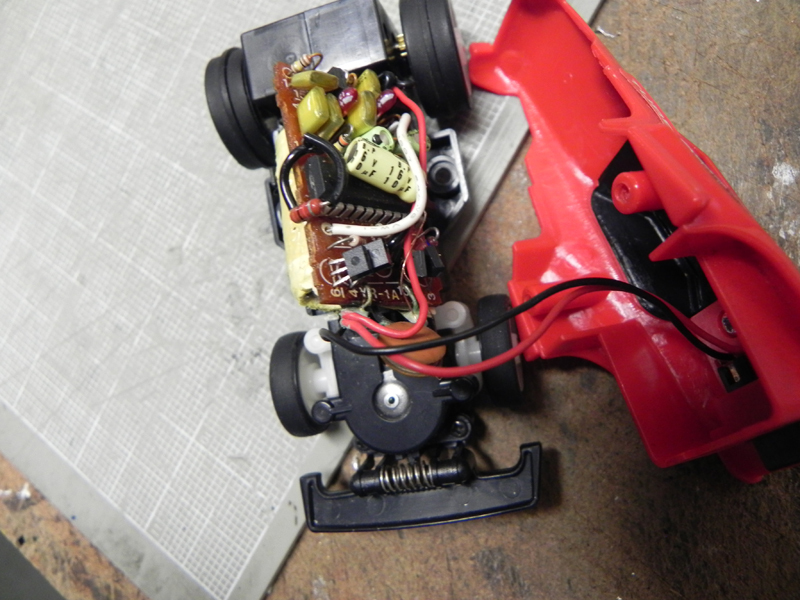 Carrera Servo wasn't RC, but a lanechanger slotcar racing system that in theory seemed good, but in reality it was terrible and offered very little play value. Carrera believed so hard in the concept that they released it in 3 different scales at the same time (1/32, 1/40, 1/60) , which of course required substantial Investments. After a first sensation in the market, Carrera Servo flopped badly, Carrera went bankrupt and the owner of the company and his mother commited suicide together. So Nikko should really have known better and not have released their own version of a similar system. 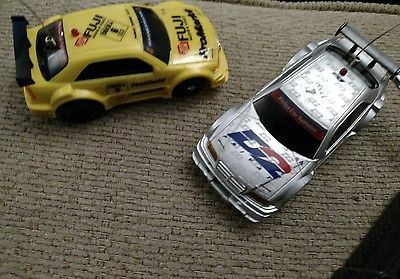 Anyway, my track came with two relatively unrealistic looking Mercedes C-Class DTM cars. Basic function of the set is that the cars are first charged. Doesn't take long as there is just a capacitor inside and no battery. Once charged, you can start running. Because of the capacitor's tiny capacity, the cars are charged when running down the longest straight section, but are powered by the capacitors only on the rest of the track. Just like Carrera Servo, the cars are pretty slow, if you come too fast into a curve, the cars will "ratchet" along the outer barrier, but not come off the track. Also, changing lanes is more of a binary shift than a linear movement and the car is faster around the track if you stay in the same lane all the time. So lane changing is nothing more than a novelty that you get bored of and annoyed by within minutes. Contrary to normal slotracing, you're hardly in control of the cars and there is absolutely no sense of handling. I spent an hour or so with the track together with a couple of friends, then sold it to one of our customers for half the price I paid. Needless to say, I warned him that it was very poor value for money even at a quarter of the original price, but he claimed he knew exactly what to expect, so I accepted his payment with just a modestly bad conscience. Btw, when searching for pics, I found a buggy version I didn't know existed. Thank you for your advise. I will keep that in mind. Thank you Mokei Kagaku for this bunch of information. Very interesting. I've had a Carrera Servo 140 by myself when I was a child. It was very disappointing because it never really worked. Nevertheless I've bought three Servo cars on that sale, two 1:60 "obstacle" cars and a 1:32 Kenworth Truck. Don't know what to do with it. Maybe I will sell it, maybe I will keep it.